Continuing its mission of recognising the creative vision of architects and designers, Shaw Contract has announced the winners of the 2018 Shaw Contract Design Awards. The 13th year of the awards attracted over 500 entries submitted from 36 countries around the world. A panel of expert international judges, who were drawn from across the industry, selected five final winners. Design industry experts also had the opportunity to vote for the People’s Choice winner. The Awards place a spotlight on a diverse range of talents from across the globe, celebrating design in action and purposefully rewarding the innovative and truly inspiring work being done by the architecture and design community. The jurors reviewed the challenges, processes and results of each project and how each design team defined design. A persistent design theme in many of the winning projects was an emphasis on bringing the feeling of home into contract environments. It’s also the fifth year in a row that Australian projects have taken out a final award, truly showcasing Australian design on the global stage. Take a look at the winners below. Gray Puksand has delivered the first stage of this exciting workspace project creating the new home for Australian fashion retail icons David Jones and Country Road Group. A bold black and natural palette references the creative fashion house and this is softened with natural timbers, stones and pastel upholstery, celebrating the country’s diverse landscapes and natural features. Ellucian – a higher education software and services provider – wanted a new headquarters to position the company alongside other technology and business leaders. 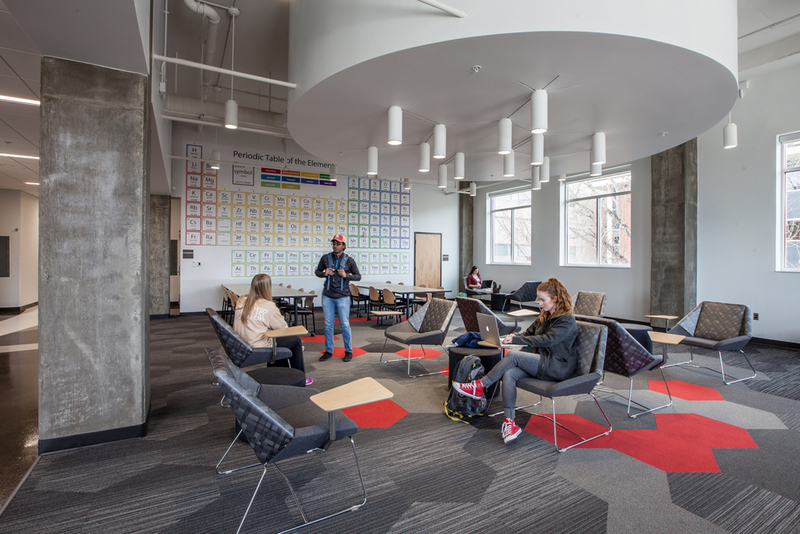 The new office draws inspiration from the universities they serve, and the open plan space draws people through a landscape that is inspired by a campus. The dynamic workplace centres around two unique two-story experiences that take advantage of non-linear movement through three floors. Being an open environment, the floor plane becomes a very important design feature. Shaw’s Alchemy and Grounded carpets enhance the strong angular directions of the building and create an organised plan within a dynamic space. The 360-degree view over the city of Rotterdam from the 25th floor of the Millennium Tower provides a spectacular backdrop to the office interior of Rotterdam-based law firm Habraken Rutten. 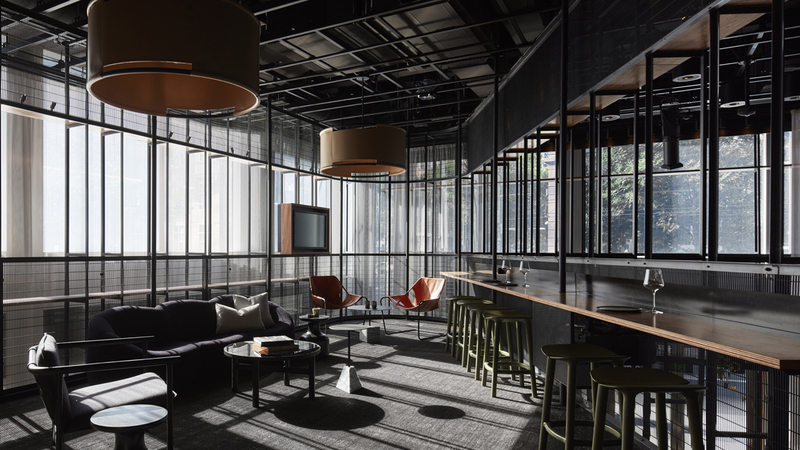 Although the interior may be serene at first glance, the tactile use of worn materials form a rich contrast throughout the office. Referring to the industrial field of work the client operates in, subtle graphics are translated into wool-panelled cupboards creating astonishing interior views. The use of colour is toned down to the bare essential. 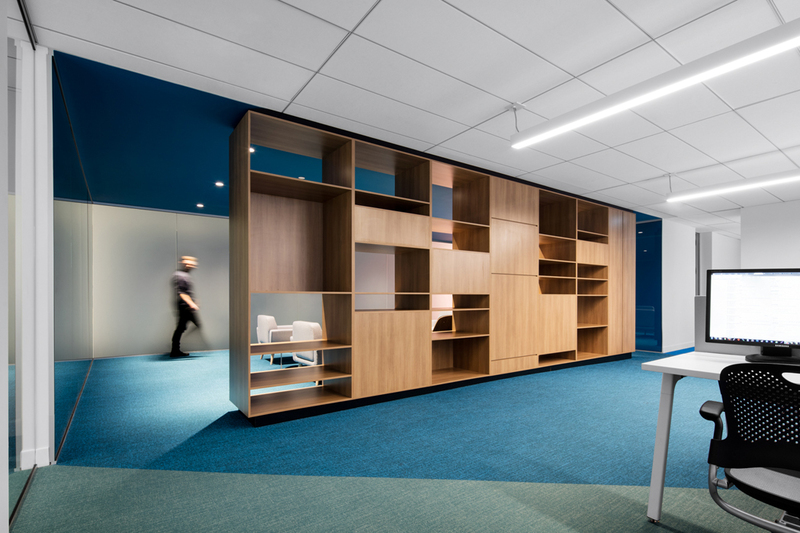 By adding a refined and balanced lighting plan, the Habraken Rutten office transforms itself in the nightly hours, far from being a standard office. The design for the Mercedes Me concept store responds to a multi-faceted brief focused on creating a space that would enable Mercedes-Benz to engage with a younger and more diverse demographic. A key aspect of the brief was to provide Mercedes Me with a ‘local flavour’ and this was achieved through the use of a refined palette of leather, limestone, polished concrete, timber and steel, which speaks to a discerning clientele of Melburnians already familiar with Mercedes-Benz’s reputation for fine design. Playster is a young and fast-moving company that provides a global subscription-based entertainment service. In order to give its clients an environment suited to their energy and creativity, ACDF transformed the company’s headquarters using the power of design and colour. The architects proposed a vibrant chromatic pattern that reinvents the 18,000-square-foot space. Reminiscent of the company’s logo, the blocks of colour on the walls and the carpets create a strong visual impact. In their progression, the different shades define specific zones spreading in a fluid movement. The design concept behind this project was to display traditional scientific elements in a way that felt new and exciting in order to engage as many students as possible. The architects wanted the design of the building itself to reflect core scientific concepts, reinforce the curriculum being taught within its walls and inspire scientific thinking. For more information on the winners and the awards program, head over to the Shaw Contract website.